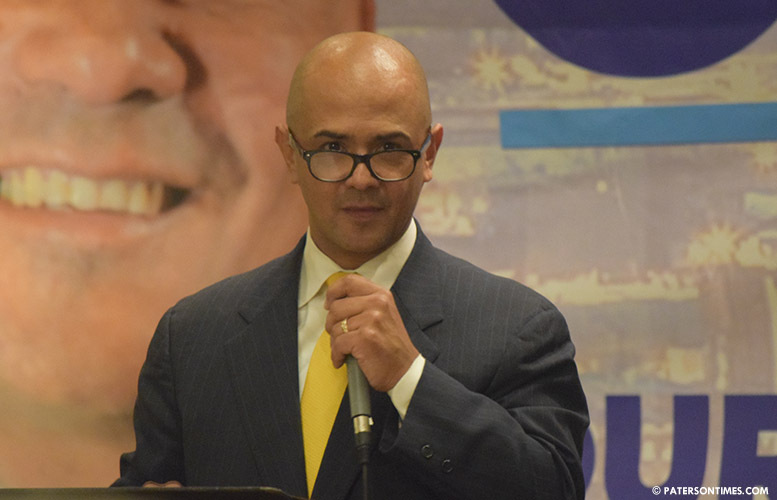 Detective Alex Cruz, whose eligibility to run for office in Paterson continues to be questioned, has secured the endorsement of his colleagues in the police force. Cruz has been endorsed for mayor by the Police Benevolent Association (PBA), Local 1, and the Superior Officers’ Association (SOA), Local 1. He received both endorsements in February. Cruz has served as the president of the PBA since 2011. Police officers voted 179-83 in a controversial mandatory vote in late February to support Cruz, according to an unofficial vote tally obtained by the Paterson Times. Vaughan Patterson, vice president of the police officers’ union, did not respond to a call for comment for this report. Cruz received the support of the superior officers’ union in a near “unanimous” vote, said Mason Maher III, president of the Superior Officers’ Association (SOA), which has 105 members. Maher said the association’s board met in early February and voted to back Cruz. “He’s not a politician,” said Maher. He said Cruz will be able to bring on more new officers as older ones retire to build a safe Paterson. Some police officers privately expressed their displeasure at the forced vote. Police officers fear it will invite retaliation if Cruz loses the race. Cruz continues to face questions over his residency. He changed his voting address from Little Falls to Paterson in July 2017 and fails to meet the one-year requirement to run for or assume office in the city. No official decisions have been made on Cruz’s residency issue. The mandatory vote of the officers’ union has been criticized by Cruz’s opponents in the mayoral race. Rodriguez works as a telecommunication systems analyst in the police department. He makes $73,000, according to municipal records. Some of the candidates viewed the process as unfair. It excluded everyone except Cruz. “We should have been afforded an opportunity to screen. To at least speak to the membership – in all fairness,” said councilman Andre Sayegh. He has patrolled these Paterson streets for years and that's no easy assignment. Alot of residents in the city know him whether black,white,Latino and Hispanics. He's been a people's law enforcement officer and he's been fair to all nationalities while serving and protecting this city. Even though I was on the outside looking in. Just giving you what I seen and the input of the few who came in contact with him in the streets for years.